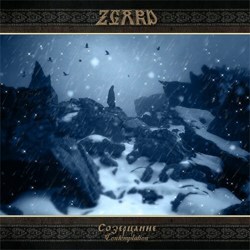 Ukrainian atmospheric pagan black metal band Zgard will release its fourth full-length album entitled “Contemplation” via the Ukrainian label Svarga Music on June 23rd 2014. For the past four years, one-man outfit Zgard has been patiently developing an intensely personal vision of pagan-oriented black metal. Now, with the release of his fourth album, Zgard mastermind Yaromisl has perfected his craft, showing a rawer, yet no-less-grandiose, side that vividly illustrates the Carpathian mysticism at the heart of that craft. Compared to its celebrated predecessors, 2012′s “Reclusion” and 2013′s “Astral Glow“, Zgard here go for an atmosphere that’s less cosmic and more organic, stirring both bloodlust and majesty within the listener, as Yaromisl guides each of the seven tracks along an epic path. As always, the native folk touches are at the forefront but never threaten to overwhelm. As a title then, “Contemplation” is more than fitting. This release will be available in standard jewel-case edition and in a limited to 100 copies 6 panel digipak edition with different cover (you can see it below). Both versions are available for pre-order at the label’s webshop.